We are thrilled to announce that since the turn of the year, we have scooped two high profile awards and have been nominated for four more awards in the Home Improvement retail and Hospitality design sectors. Our wonderful client C.P. Hart was awarded ‘Best Retailer of the Year’ at the Homes & Gardens Awards, celebrating Britain’s hottest design talent, on February 26th. The winning “pioneering” showroom in Fulham, designed by I-AM, was praised for offering a glimpse into the future of retailing, thanks to its virtual consultation hub and unique multi-media art installation by Jason Bruges. On the same evening, our friends at Chilango – aka, best burrito joints in London – were ‘Highly Recommended’ at the Casual Dining Design Awards 2014, landing second-place in the ‘Best Multiple Restaurants’ category. The awards celebrate design as an integral part of the casual dining industry, so we were thrilled to be recognised for our efforts. As for the nominations: two other I-AM projects, FarahFeza and Pizza Union, were short-listed at the Casual Dining Design Awards 2014 in the ‘Best Independent Restaurant’ category. 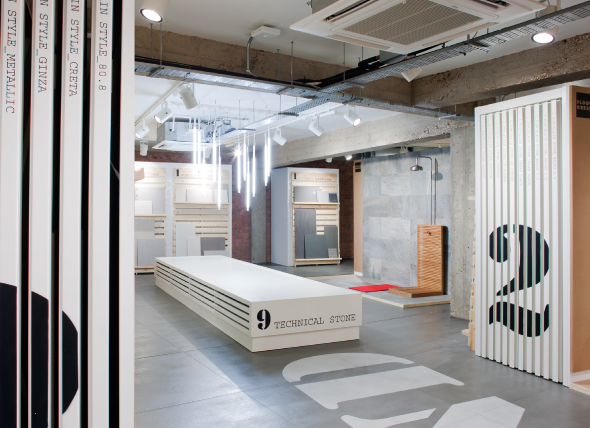 Finally, our work ‘Domus_W1’ for tiles specialists Domus was also recognised and short-listed in the ‘Best Retail Interiors’ category, both at the Drum Design Awards 2014 and Design Week Awards 2014. We will have to wait until April 30th and May 15th for the winners to be announced, so watch this space! Needless to say, we are thrilled for the recognition in the realm of branding and design and delighted for our clients’ wins and success.